PAYDAY Peanut Caramel Bars make every day better! These delicious candy bars, made of peanuts and caramel, are a great way to enrich Halloween or any day of the week! Ingredients: Peanuts, Cane Sugar, Corn Syrup, Nonfat Milk, Vegetable Oil (Palm and Sunflower Oil), Contains 2% or Less of: Salt, Carrageenan, Mono- and Diglycerides. Fast delivery. Candy was fresh. Sometimes online vendors ship out product that is near the end of its shelf life. Well I loved the price, bought 3 bags have 8 grand kids, but one bag was 2 months past the sell by date. The other two had a sell by date of 04-2019. They were still good. I would not recommend these to a friend for a couple of reasons: they might be allergic to peanuts, and they probably don't need the sugar anymore than I do. For a decadent indulgence, however, these little bars are just the right size to satisfy a craving for sweetness and crunch. I like these waaaay too much. 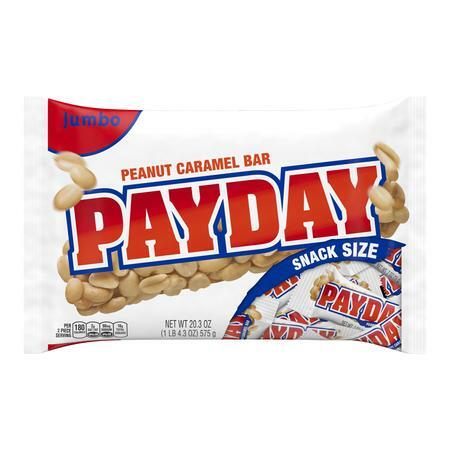 My entire family just LOVES these Payday bars. I regularly purchase 2-3 bags every few weeks. Will be back for more. Price and service are superb.